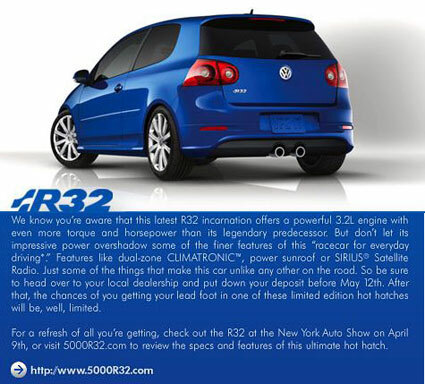 The Volkswagen special performance edition R32 is available for orders and should show up in American toward the end of summer 2007. (mentioned before) The current email indicates a new website for those who may have previously shown an interest. Although it is most likely overpriced, the limited edition specialty vehicle would be a pretty nice vehicle for those enjoying small pocket rocket Vee-Dubs. If you want one … you might try to get an order in soon as I’m guessing that all 5000 will be spoken for?? ?